How to participate: Share the first line (or two) of the book you are currently reading. Include the title and the author so we know what you're reading. Then, if you feel so moved, let us know what your first impressions were based on that first line, and let us know if you liked or did not like the sentence. The link-up will be at Rose City Reader every Friday. I am having a huge day today: it's my Birthday (yay!) and I am flying to London. This is the book I've chosen to read on the plane, if my daughter will allow me the time to read, that is. "Imagine that a slightly different version of you walks across a room, looks you in the eye, and says hello in your voice. You discover she has the same Birthday, the same allergies, the same tics, and hte same way of laughing." 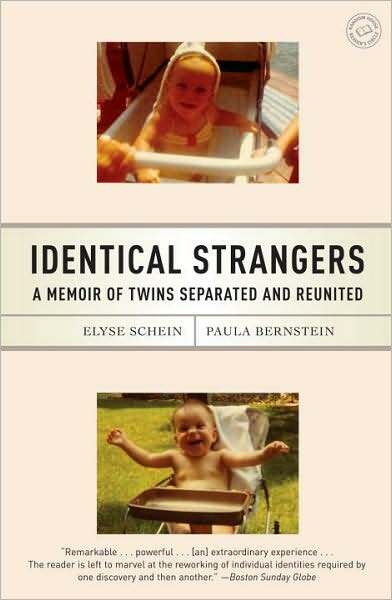 Twins hold a certain fascination for many of us, I believe and this true story is sure to fascinate me. It was recommended to me by Bonnie of Bonnie's Books.